You have very clever and inventive ways of pushing the game's graphic capabilities, boz. Wow, I really, really hope this gets released...it's amazing. No news at all? Development stopped? Or still working hard? He studies so he hasn't time for modding. So be patient, when he will have some time he will make it for sure (at least I hope he will). However he also makes LS3D Sandbox and I think it's his main project. What happened?it has been a long .i liked this mod but when it will be complete.its graphics were amazing. I'm sure he's just busy with exams. how much time will it take can you tell? happening in regards to the development of Boz Mod. Thanks for the ****, in the last comment I wanted to say that how much time will he take to finish his exams, sorry for wrong comment. I will be so happy if he start his mod again and do a good result in his exams. I have changed the caps-lock type to upper and lower case. impression that you are shouting. work and this topic deserves sticky status. This is the reason why I suspend everything about Mafia from September to May. The lack of time. 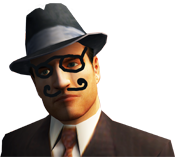 My top priority about Mafia is (and still is over two years) to finish LS3D Sandbox. Again, I hope to finish it (or major part) in September 2015. Then, I can revive the work on Boz Mod. I want to make some extensions for DTA archives. You know, rw_data.dll is used as filesystem library for access the files in DTA archives or in folders. I managed to reimplement basic funcionality of old rw_data.dll into my own rw_data. Now I can add some new functions about files and archives. First thing that came to mind is possibility to pack user mods into one simple archive (zip, ...) which would be accessed by game system (like old DTAs). Eventually with encrypt protection (also like old DTAs but with better encryption). DTA files can be replaced by zip? Then as with them will work Mafia World Editor? You never stop with adding amazing functions do you? haha that is awesome! My biggest worry with releasing the Titanic mod as a free project is that within one week, more than 1500 lazy thieves steal all of my models and textures and plaster these around the internet with a big © stamp next to their names. I can tell by the vast amount of people that already tried to steal my work. If I can place the whole project within a protected and encrypted file, I don't have to worry about this piracy anymore and see 8+ years of work going down the drain. And not just that, it would be very useful as well if one would want to install multiple mods without mixing them up. If you would implement this feature, is it possible to make the RWdata.dll read multiple 'custom' DTA files and give priority to which file must be read first? I ask because, if I would have to make a patch for a 2GB mod, it would be far easier to release a stand alone patch that people can install into their Mafia folder instead of having to reupload the whole mod again with a few fixed files in it. E.G. my mod is in TitanicV1.DTA. I have made a few fixes, and created a patch named TitanicV1.1.DTA. It would be great if RWdata.dll would recognize this file as a patch file for a main DTA file. This way, both the original mod and the patch remain encrypted, and I don't need to reupload the mod every time a patch is made.